Want to find out the benefits of Lemon Juice? I have some quick facts here for you. Talking about color rotation in our juicing for weight loss program, my primary suggestion is the 5-Green Juice. Lemon Juice is my priority in terms of the yellow series. Due to its acidity nature, few people would consume lemon juice without dilution. Hence what we drink is more often lemon water. Lemon and water are both so inexpensive and easily available, making it an ideal juice fasting recipe. NOTE: To obtain the maximum health benefits of lemon juice, do not only drink on your juice fasting day. You can actually drink it everyday or as often as you wish. A glass of fresh cool lemon water first in the morning can stimulate the system and instigate weight loss. This is one of the top benefits of lemon juice that I’ve enjoyed. Our liver produces bile. The bile is used to aid in digestion. Lemon stimulates the liver to produce additional bile. As a result, drinking lemon water can help to stimulate digestion by activating the stomach digestive juices. This can help to alleviate symptoms of indigestion, bloating and associated discomfort. You can even squeeze a small amount of lemon into a glass of water with each meal to promote healthy digestion. Drinking plenty of cool water mixed with fresh lemon juice can flush toxins from the body keeping the system cleansed and healthy. Ladies should love this benefit most. Vitamin C builds up our body's immunity. This vitamin helps promote natural healing within our body and replacement of many different cells. Lemon juice is very rich in Vitamin C. As a result, drinking lemon juice can give us healthier skin, decrease our chances of infections and even help wounds heal faster. Our body needs calcium to build bone density and sustain a healthy nervous system. 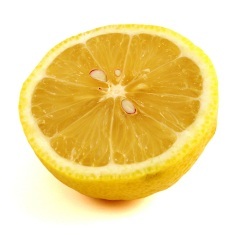 Lemon juice is high in calcium. Our teeth, bones and central nervous system all benefit from drinking lemon juice. Calcium provides our body with energy as well. If you are low on energy, drinking a glass of lemon juice is a natural way to increase energy without sodium, sugar or caffeine. In fact, you can make lemon juice according to your personal taste. In general, if you are in good health and weigh less than 150 pounds, half a lemon a day mixed with purified water will be ideal. If you weigh over 150 pounds, use one lemon a day. Sweet lemon? Right. Some lemons are more sweet than others. A rule of thumb for selecting a lemon that is both sweet and high in mineral content, is to pick one that has a high specific gravity measurement and is heavy for its size. By comparing equal-sized fruit, the one with the greatest weight will have the most mineral content and sugar. A thick skinned lemon will not be as heavy as a thin skinned lemon and will not have the desired sweetness or mineral content. As there are numerous health benefits of lemon juice, do not limit yourself to drinking it only on your juice fasting day. Drinking plenty of water is important in a healthy system, and adding a little lemon can improve the effects of proper hydration even more. Make it part of your daily routine to drink a glass of cool lemon water in the morning and then open your gateway to enjoy its health benefits. Be sure to look for fresh organic lemons for a daily body weight control, detox and cleanse. NOTE: Green vegetable juices are great to start a juice fasting morning, same as lemon water. Feel free to alternate between the two. While many of us love lemon for its fragrance and refreshing feel, have you ever imagined that it will change our lives? In deed, it will. A Lemonade Fasting Diet, aka The Master Cleanse, is responsible for weight loss and many other health benefits. Many describe it as a life transformation exercise where they enjoy new and better lives after going through it. Beyonce Knowles, David Blaine, Billy Bob Thornton, Robin Quivers and other celebrities all praise "The Lemonade Diet" for everything from weight loss to detox and restoring their energy and healthy eating habits. Personally I don’t fancy celebrity weight loss. Most of their success stories are too commercial. However as someone with fasting weight loss success experience, I had no doubt on the Lemonade Fasting Diet. NOTE: I don't encourage your encountering the Master Cleanse before finding out the exact steps of doing it. Though it has lots of health benefits, it is not easy. Some people can't even do it for one day. If you do want to give it a try, visit the Master Cleanse Secrets website to find out more about the typical 10-day exercise.